Check their Facebook page for location details. 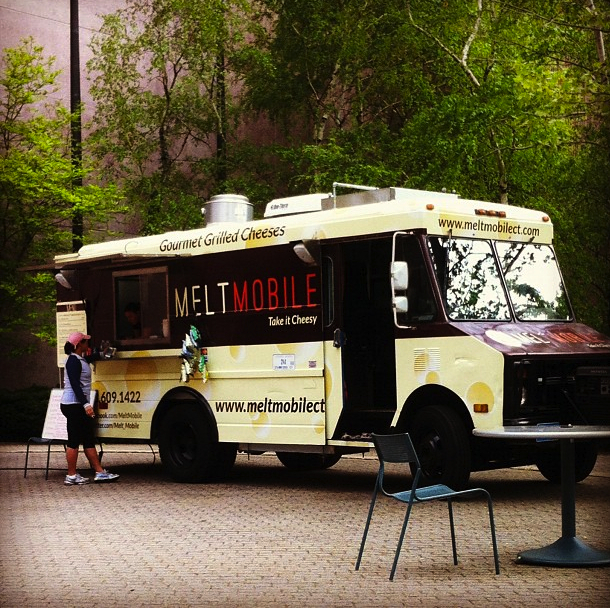 Original Melt – House blend of Tillamook Cheddar, Gruyere,Monterey Jack on Country White Bread. The Insanewich – A grilled 6oz Angus burger with Bacon, shredded Lettuce, chopped Tomatoes and Melt Sauce between 2 Originals. Meatball 3 Cheese Squeeze – Diana’s Meatballs in Marinara, Fresh Mozzarella, Pecorino Romano, Parmigiano Reggiano and Fresh Basil on Tuscan Bread. The Pork – U – Pine – Tillamook Cheddar, bbq pulled Pork, caramelized Onions, and sliced Dill Pickles on buttery grilled Country White. The Svelte Melt(350 Cal) – Lowfat Jarlsberg, oven roasted Turkey, Roma Tomatoes, whole grain Honey Mustard grilled on a 7 Grain. Montecristo – Herb baked Country Ham, farm fresh Turkey, house Cheese blend [Cheddar\Gruyere\Jack] on Challah Bread dipped in French Toast battered and grilled, sprinkled with powdered Sugar and served with Mixed Berry Preserves. The Caprese – Fresh mozzarella, Prosciutto di Parma, fire roasted peppers, tomato, arugula and pesto aioli on kalamata olive bread. The Strawberry Supreme Melt -Fresh Strawberries, Nutella and Vanilla infused Mascarpone on crunchy Tuscan Bread dusted with powdered Sugar. The Fluffernutter – Caramelized Bananas, Marshmallow Fluff, Belgian Chocolate and Peanut Butter on crunchy Tuscan Bread dusted with powdered Sugar. I’ve tried the original & added caramelized onions, the meatball grilled cheese, and the pork – u – pine…loved them all! This entry was posted in Food Trucks, Greenwich, It's all cheesy, Stamford and tagged beer garden, beer garden harbor point, beer garden stamford ct, cheese, Cheese sandwich, connecticut, ct 2013, Facebook, ferry to food trucks stamford, food, Food Truck, food trucks connecticut, food trucks in greenwich connecticut, Grilled Cheese, harbor point, Meatball, Melt Mobile, Pork, sandwich, stamford, Stamford Connecticut, Veteran's Park. Bookmark the permalink.